The First Baptist Church of Darlington was organized in 1831 and quickly joined the Welsh Neck Association in 1832. The Welsh Neck Association was born of an area along the Great Pee Dee River near Society Hill called Welsh Neck after a group of Welsh Baptists from Delaware settled there in 1736. The Baptist settlers established Welsh Neck Baptist Church in 1738, and from that church many other Baptist churches in Darlington County were founded, leading to the formation of the Welsh Neck Association. First Baptist’s congregation originally called itself the Baptist Church of Christ and, unlike many churches, actually built its first church building in 1830, one year prior to its official formation. (Other early churches often relied on brush arbors, public buildings, or a congregant’s homes until they could construct a sanctuary.) The Baptist Church of Christ’s original church was replaced in 1859, and the church bells from that second church were melted and used to cast cannons during the Civil War. Following the war, former slaves who had been worshiping here with their owners left to form their own churches, including nearby Macedonia Baptist Church. The third and present building was built in 1912 in the Georgian Revival style. The Baptist Church of Christ changed its name to First Baptist Church of Darlington that year. The First Baptist Church is architecturally significant as an example of the Georgian Revival style. Built in 1912, the large, rectangular brick edifice is distinguished by a Roman Doric pedimented portico, which displays an entablature with medallions between tryglyphs. Within the front portico are three recessed doorways with semicircular fanlights, above which, at balcony level, are similar fanlights. A steeple is located on the ridge of the roof and rests in part on the portico roof. The steeple is characterized by several stages: a square base with sandstone quoins and circular windows; an octagonal masonry lantern featuring round-arched louvered vents and Roman Doric corner pilaster and entablatures, capped and encircled by a balustrade with decorative urns; an octagonal wood section above containing circular windows in each bay and terminating in a copper spire surmounted by a cross. The adjacent church building, which was completed as a wooden structure in 1859 was then used for Sunday School and other youth activities. This building was remodeled extensively in 1924 to its present brick appearance and connected to the sanctuary by an arched loggia. The cemetery at the back of the property dates from the 1820’s and contains many of Darlington’s most noted citizens. Below is an article that was contributed to the South Carolina Picture Project by Bill Segars of Hartsville. It originally appeared in his local paper, The Darlington New & Press. It was published in September of 2015. Much has been written about Darlington Baptist Church of Christ in newspapers, and even a book has been written about its history. No, that name is not a misprint. Darlington Baptist Church of Christ was this congregation’s original name when it was established in 1831. That name served the congregation well through all of its trials and difficulties of its start-up, the War Between the States, and Reconstruction over 81 years. I’ll not attempt to rewrite or even summarize the trials of those 81 years. The First Baptist Church Darlington has the book, In God We Trust: 175 Years. It’s very interesting reading; if you get a chance, please review it. The aspect of the church that I’d like to focus on is the campus that you see today situated on the corner of South Main and West Broad streets at 216 South Main Street. You may not realize it, but this corner actually houses the second and third church buildings of the three buildings that have served this congregation. The first building of 1830 was disposed of for $800 on June 2, 1866. The present sanctuary, the third building, was dedicated on December 8, 1912. At that time, the name was changed to First Baptist Church Darlington. But where is the second building from 1859? Think about that as we continue; we’ll find out in good time. 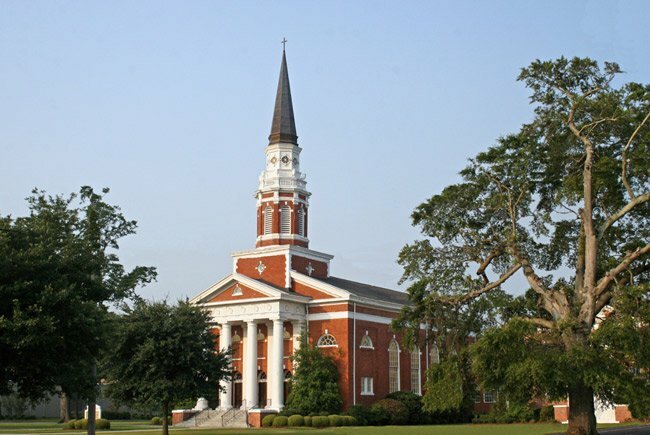 Unfortunately, during a very critical time in the history of First Baptist Church Darlington – from 1896 to 1925 – all of the church records were lost. What we do know about that time has been pieced together from memory or evidence that the 1912 building reveals. At some time prior to 1912, the decision was made to construct a new building. There is no record of the architect or the builder. Due to a mortgage, the cost of the building in 1912 was known to be $33,000. I’m going out a limb here and making a statement based on only one reference concerning the architect of this detailed building. Due to the fine architectural appointments seen on and in this building, I can safely assume that an architect was employed to design this church. The architectural firm of Shand and Lafaye had just completed St. Matthew’s Episcopal Church next door in 1906. The Baptists would certainly not be out-done in 1912 with their new building. The church has no record of an architect, but The South Carolina Architects, 1885-1935 shows William Augustus Edwards as the architect of First Baptist Church, Darlington. Even though courthouses were Edwards’ main interest in South Carolina, there are similarities in those buildings with the details seen in First Baptist. Brick Georgian Revival buildings seems to be his favorite style. He designed the razed 1906 Darlington County Courthouse, so he must have been in Darlington when First Baptist began planning its new building. My most compelling argument for Edwards’ involvement is that he was raised in Darlington. He was born on December 8, 1866, the son of Augustus Fulton Edwards and Elizabeth Sarah Hart Edwards. After graduating from St. David’s Academy in Society Hill, he went on to study mechanical engineering at Richmond College and then the University of South Carolina. After graduation he worked with Hartsville native Charles Coker Wilson, who designed his home church there. Nothing would have pleased Edwards more than to come home to design First Baptist Church. Regardless of who the architect was, we’ll all agree that the rectangular Georgian Revival building is stunning. Its symmetry, a typical sign of Georgian Architecture, can be seen on all sides. The front portico is supported by four large Roman Doric columns under an entablature with medallions between tryglyphs. The overhang dentil boxing detail houses a built in gutter system to move the water away from the massive gable roof. The six-bay exterior solid Flemish Bond brick walls have recessed brick work at the window locations. The steeple is characterized by several different stages. The masonry square base is accented by sandstone quoin corners with bull’s eye windows. The next tier is also built of brick, but octagonal in shape with round-top open louver vents to allow the sound from the bell to escape. The next tier is built of wood and stucco with bull’s eye windows. The copper spire surmounted by a cross tops the steeple. When the original 2,280 pound bell and frame were installed, fifteen men, several pulleys, and a lot of rope were required to hoist this unit up and into the second tier. This is not the original steeple. On April 4, 1984 the top 60 feet of the steeple were blown to the ground during a storm. Ten months and $65,000 later (almost twice as much as the entire church building cost in 1912), a new steeple was raised into place by three men, a small amount of rope, and a really big crane. The First Baptist Church has been very good stewards of their corner lot with additional buildings that have been added to meet the growing membership of the congregation. On January 15, 1956 the $70,000 Jones Building was dedicated as a Sunday School building. Then on December 14, 1975 the Illy McFall Memorial Building was added to the campus as a recreation building. Almost exactly seven years later a substantial addition was made to the McFall Building. On December 11, 1982 the E.S. Howle Fellowship Hall was dedicated to enhance the spiritual and social growth of the church. A 1996-97 building project added needed office space, and many renovations were made to the existing buildings in an effort to “tie everything together.” While all of the additions do not compete with the architecture of the original sanctuary, they certainly are compatible with it. We’ve now talked about most all of the buildings on the corner, but where is the 1859 wood siding building? Do you recognize it? Most people will not, but it’s there. In 1924 the congregation decided to move the almost-abandoned structure forward and to the right of the sanctuary, encase it with a brick veneer, renovated it, and use it as an educational building. After spending $31,000 to do this, it was later named the Harding Building. The steeple bell was removed and installed on ground level to the left of the building. This disguised 1859 building is like God’s love for us, unseen but always there.